I would have to say that this is probably the most innocent looking mani I have ever seen. I always loved the konad stamp that I used for this look. I was so excited when I realized it was on one of the plates that I won.. I feel with that using that image over this green looks.. Well, innocent. I cannot think of anything else to say about it. I feel like a young girl about to have a tea party with her stuffed animals or something. You might also notice that I clipped off my longer nails. I went back to work this past weekend, and while none of my nails were broken, there were a few chips and I just think it will be easier to have my nails a wee bit shorter. Right now they are a bit shorter than I would like them to be, but I must admit that typing is MUCH EASIER! 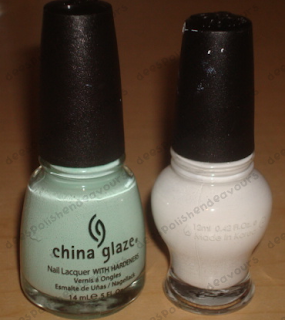 I used 2 coats of CG Re-Fresh Mint, then stamped with Konad special polish in white and sealed with Seche Vite. I am really pleased with Re-Fresh Mint, it is everything I thought it would be and more! I quite like this shade of green. Now it is just time to rest. I went on some weird cleaning rampage today.. I think it was because I am feeling guilty. I was back to work on Sunday and Monday.. Today? I slept until really late in the afternoon. Whoops! Back to work again tomorrow, then some time off until Sunday again. I am tired just thinking about it! Hope everyone is having a great day - and had an enjoyable long weekend!! shortwidenails - Thank you! I actually do seem to be going through a lucky streak lately!! I actually really like the double ended stamper.. It gives you two options size-wise. I use the larger red stamper for full sized images (except for on my pinky nail as it is quite a bit smaller), and the little green stamper for smaller images as it gives you more placement freedom. All in all, I would say it is a good investment. If you're really thinking about getting one, let me know! I have a spare kicking around that will probably only collect dust!! i'd love to buy the double end stamper from you. how much would you like to sell it for? off topic from this post can you post a swatch of CoverGirl Nailslicks in Khaki? I own one color from that collection deep sea and there's nothing left but it is my favorite color ever...hmm..i should do a post on that..but right now i'm trying to figure out if I should buy nailslicks from ebay.